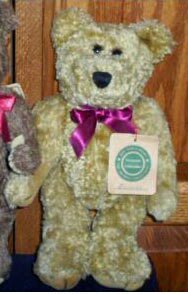 12" Plush Bear; Issued in 1997 and retired in 1999; catalog value $23.00. 12" light tan plush bear with fuzzy fur. He is a great bear with a ribbon around his neck. He is an original bear wi..
12" Plush Bear; Issued in 1997 and retired in 1999; catalog value $23.00. 12" light tan plush bear with fuzzy fur. He is a great bear with a ribbon around his neck. He is an original bear with an adorable face. He is retired.